Many times, homeowners decide to add to their home’s space, whether by building an addition or remodeling parts of their home that may not have been ideal living areas before. Unfortunately, often these areas don’t have access to the home’s ductwork, and adding it may be impractical or impossible. How can you get these areas of your home the climate control they need? You should know, ductless and converted spaces are made for each other! If you’ve added to your home, or if you’ve converted a garage, attic or basement into an area for you and your family to enjoy, ductless heating and cooling can help keep that area comfortable. It both effectively heats and cools your home, so it’s perfect for year-round use. Not to mention, by keeping a consistent climate throughout your home, your main heating and cooling systems will operate more efficiently, too. There are several benefits to installing ductless in your converted spaces. While it goes without saying that a ductless system will make those areas of your home without ductwork more comfortable, you should know that there are other advantages to ductless as well. Ductless heating and cooling is efficient. Because they use advanced heat pump technology, ductless systems offer high efficiency. As a result, they’re an extremely cost-effective choice for your space. Ductless systems are quiet. These systems are made to operate so that they don’t disturb homeowners with noisy operation. Space heaters can emit a buzzing noise, and window AC units are often loud. Conversely, ductless is whisper-quiet, so you’re able to better enjoy the comfort. Heating and cooling with ductless can help with air quality. Ductless systems are made to filter the conditioned air they push out into your living space. They trap many of the particles that can get circulated through the air. As a result, ductless creates a cleaner environment with fewer allergens. Ductless systems are non-obtrusive. Having your ductless system installed requires very little construction work, and you won’t have to worry about the cost and mess that comes with adding ductwork to your home. And, ductless systems are made to blend in seamlessly with virtually any home décor. Make your converted space or addition one the whole family falls in love with this February – choose ductless heating and cooling to make it a welcoming area year round. At T.F. O’Brien, we’re happy to help you get the ductless system you need for your home. Just give us a call at 516.488.1800, and we’ll see if ductless is the perfect match for you! The arrival of spring also means the arrival of allergy season for many, and for those who suffer from allergy, asthma and other respiratory conditions, breathing easy can be difficult. It’s important for everyone that the quality of the indoor air they breathe is clean, fresh and healthy. According to the Environmental Protection Agency (EPA), there are three ways you can take a proactive approach to your indoor air quality so that you and your loved ones can breathe better this season: controlling the source, improving ventilation and installing air cleaning devices. Source control is, basically, mitigating or removing anything that’s causing indoor air pollution in your home. That means removing any mold or mildew in living areas as well as in places like your basement, having your gas stove adjusted so emissions are decreased, and stopping activities that contribute to indoor air pollution like smoking tobacco or burning certain candles and incenses. You might also look at the type of chemicals you’re using for home cleaning, as some can cause breathing problems and allergic reactions. Improved ventilation is another way you can help improve the quality of the air inside your home. Ventilation is, basically, bringing fresh air from outside into your home. Since most HVAC equipment like furnaces and air conditioners are basically designed to circulate indoor air, you’re pretty much always breathing the same air in your home, unless you have good ventilation. Opening windows is one way to get fresh air inside, but often this isn’t enough. Many people today are opting for whole house ventilation systems, which help eliminate issues like allergens, indoor pollutant and humidity by bringing fresh air into your home. Air cleaners, especially whole-house systems, can be effective in the removal of certain particles in the air you breathe in your home. Air cleaners help get rid of indoor pollutants like mold, dust, dander and some bacteria. Those equipped with a HEPA filter can capture at least 90 percent of all particles sized 0.3 microns or larger in diameter. While air cleaners can effectively remove particles in your indoor air, they require upkeep, and filters need to be changed according to manufacturer specifications in order for them to continue to work properly. Air cleaners should be used in conjunction with source control and improved ventilation. If you’re having trouble with the quality of air in your home, the best thing you can do for you and your family is contact a qualified home comfort company to help. Because they’re highly trained and use the right equipment and measuring devices, they can quickly discover your indoor air quality problems, make the right recommendations, and install the equipment you need for improved indoor air. When you call T.F. O’Brien, we can help you with your air quality concerns and more. Just give us a call at 516.488.1800, and we will be more than happy to help you get the IAQ you and your family deserve. Heat recovery ventilators (HRVs) are among the most energy-efficient ventilation systems available. They pull fresh air inside, filtering it while expelling stale air. They also essentially “recapture” the energy of the outgoing, stale air and “give” it to the incoming air. Typical heat recovery ventilators can recycle about 85 percent of this warm or cool energy, taking strain off your HVAC system. There are a plenty of HRV models that attach to pre-existing ductwork. Heat recovery ventilators accomplish the heat exchange inside the heat exchanger core, where the currents of incoming fresh air and outgoing stale air both pass. This is where the energy is collected and saved. The two different air flows, however, do not cross. The U.S. Environmental Protection Agency and the American Lung Association recommend HRVs as some of the best ventilation systems on the market to improve indoor air quality and health. If you achieve energy savings with a tightly sealed home, your indoor air is probably not well circulated, leading to indoor pollution. Off-gassing and fumes from building materials and carpets. Mold, allergens, dust, and airborne bacteria and viruses. Carbon dioxide exhaled by residents (each person exhales about 1 kg per day). Fresh, filtered air can lead to vast improvements for many individuals plagued by recurring issues such as respiratory problems, headaches, allergies, lethargy and more. In the ongoing quest for energy efficiency, heat recovery ventilators are good investments, and can extend the life span of your HVAC system. If you’re thinking about improving your indoor air quality and want expert advice, feel free to call the professionals at T. F. O’Brien. We’re happy to help. Our goal is to help educate our customers about energy and home comfort issues (specific to HVAC systems). For more information about heat recovery ventilators and other HVAC topics, click here to download our free Home Comfort Resource guide. Posted in Kerry's HVAC Blog, VentilatingTagged air flows, american lung association, ductwork, environmental protection agency, heat recovery ventilators, incoming air, indoor air quality, indoor pollution, ventilation systemsLeave a Comment on What is a Heat Recovery Ventilator? Probably few of us give much thought to how our heating & air conditioning system is set up. As long as we stay cool in the summer and warm in the winter, we’re fine. There are a few things, however, that we ought to know to prevent problems. A major item to be aware of is our home air returns. In most homes, air returns are located on or near the floor. Depending on the type in your particular home, you may not be able to tell an air return from a heat or cooling vent. That’s fine as long as they aren’t blocked and you’re having no problems. There are two types of methods to circulate the air in a home. The first is a gravity system where cooler air near the floor falls into the air return and ducting. The second is a forced-air type. A system fan creates a suction that helps pull air into the returns. Air returns in any heating & air conditioning system do a couple of important things. First, they keep us comfortable. The air falls or is pulled back into the system to be recycled. In an optimum situation, it is then blown into a room at one area, circulating through the room, going back again at roughly the same rate to be reprocessed. This action helps maintain a constant temperature. As we and the air in a room move, dust, pollen, pet dander and microbes also move through the air. 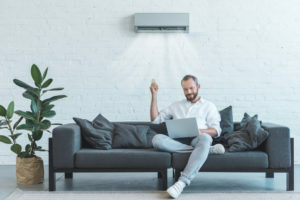 That air enters the return, and get processed and filtered through the heating & air conditioning system, and returns to the room as both clean and comfortable air. A proper heating & air conditioning system keeps a balance between air coming into and air leaving a room. If a room feels stuffy in either the summer or winter, there may not be enough air returns in the room. Another reason might be that a return is blocked. Always be sure the air returns are open for good circulation. T.F. O’Brien services the Long Island, New York area. Our goal is to help educate our customers about energy and home comfort issues (specific to HVAC systems). For more information about preventive maintenance and other HVAC topics, please download our free Home Comfort Resource guide. There is nothing more important than the safety of your family. You would like to think that in the confines of your home, you would have nothing to fear. However, the is a potential danger lurking right inside your house. Indoor air pollution is more of a threat to most of us than the smog of polluted cities and the only way to protect your loved ones is through proper ventilation systems. Houses today are built â€œtightâ€ to keep the air inside from leaking out. The pursuit of energy efficiency, though, has put at risk from stale air that does not circulate properly. The newer homes being built today are more susceptible to mold and mildew and dangerous gases like carbon monoxide or radon. The telltale signs of poor ventilation are moisture that gathers on the windows, mildew on walls and foul odors which linger. A temporary solution can be just opening windows to air the home out. However, this does not provide conditioned air at the proper humidity, and can actually cause additional problems for your indoor air quality. A better solution is installation of one of a number of good ventilation systems. Our skilled technicians can evaluate your home and recommend which of the available state-of-the-art ventilation systems will work best in your home. Quality ventilation systems start out at about $500 and will only cost $10-15 per month to operate. Some of the best ventilation systems on the market today include energy saving features which can capture the warm air before it leaves your home and recycle it into the fresh air coming back in. The new models also have features which can remove moisture from the air which is perfect for New York’s humid summers. These exchange units usually pay for themselves in a short time because your current heating and air conditioning units will be running less. The New York State Energy Research and Development Authority has put together an excellent guide for home ventilation solutions. To get it, click here. Ventilation is critical to home comfort. Proper ventilation prevents air pollutants from affecting the health of you and your family. Not only that, having airflow in your home can get rid of any unwanted smells, such as from cooking or pets. It is also good to have an airflow that is uninterrupted, as anything blocking the air flow in your home can cause damage to both your home and your health. One of the reasons ventilation is so important is because it controls how much moisture is lingering in your home. If you have adequate airflow throughout your home, your walls, floors, and all the wood in your home will stay dry and not collect moisture. Wood can rot when exposed to moisture, as can drywall. If you let moisture build up in these areas of your home, they will not only destroy the structural integrity, but they will also cause mold to build up. Mold can have a number of negative effects on your health if you are exposed to it for a long time. If you’re not exposed to mold for a long time, you might notice some minor symptoms, such as irritation to your nose, throat, and eyes. You might possibly develop a headache or a fever if you’re exposed for a longer period of time. Mold can both cause immune system problems and worsen the symptoms for someone who already has an autoimmune disease. Prolonged exposure to mold can result in respiratory damage that can’t be reversed, such as asthma. If you have proper ventilation in your home, you won’t have to worry about mold forming. There are three ways you can provide ventilation to your home. You can choose to have natural ventilation. This is when air enters your home through windows, doors, and even cracks and holes in the walls of your home. If you live in an old home, it’s likely that air is entering your home even when you have the windows shut. Spot airflow is when you use exhaust fans or other forms of pushing air in or out of your house in certain spots. Typically, you might have an exhaust fan over your stove or in your bathroom. You can also have air ducts installed around your whole home to provide airflow throughout your home. There are three different ways air is moved through your home when this method of moving air is used. The exhaust airflow system pushes inside air to the outside of your home. The supply air system brings air into your home. Then, there is a balanced system of air that moves air in and out of your home. If you have one of these air systems, it’s important to keep it maintained so it doesn’t get blocked and allow air pollutants to lurk in your home.